* tail is often flicket! A cautious, sharp-voiced bird of the waterside, this species has managed to exploit most stretches of fresh water, however small, and is common and sometimes tame on village and town ponds. It walks on land and swims with nodding head, feeding on insects and small water creatures, waterweeds, seeds, and berries. • NliST A neat, bowl-shaped nest made of reeds and stems, concealed in growing plants at or above water level. • DISTRIBUTION Parts of North and South America, Africa. Europe, Asia as far south as Java, and the W. Pacific. At first sight, this bird resembles the Common Moorhen, but it is more brightly colored and has a more slender build, with longer neck and legs. In adults, the legs are bright yellow and the hard "shield" over the bill is bright blue. 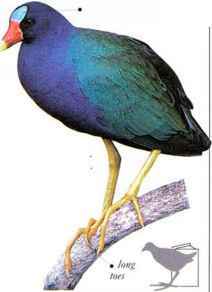 The Purple Gallinule occurs on lakes, pools, waterways, and wet marshes, where vegetation is tall and abundant, in regions where the climate is warm. It wades and walks easily over floating plants and water lilies with its long-toed feet. Although it wi venture onto open ground to feed, it does not stray far from cover. It walks with an upward jerking tail and on shorter flights the legs dangle Birds often climb up reeds, rice plants, bushes, and trees, in order to feed The diet consists of invertebrates, frogs, waterplants, seeds, and berries. • NEST a bulky cup nest made of fresh or dead stems and leaves of rushes and cattails, built in marshland and situated in plants in or near water, or in bushes above water level. USA, Central America, ^^^^ West Indies, and ^^' South America to distribution juvenile n. Argentina.